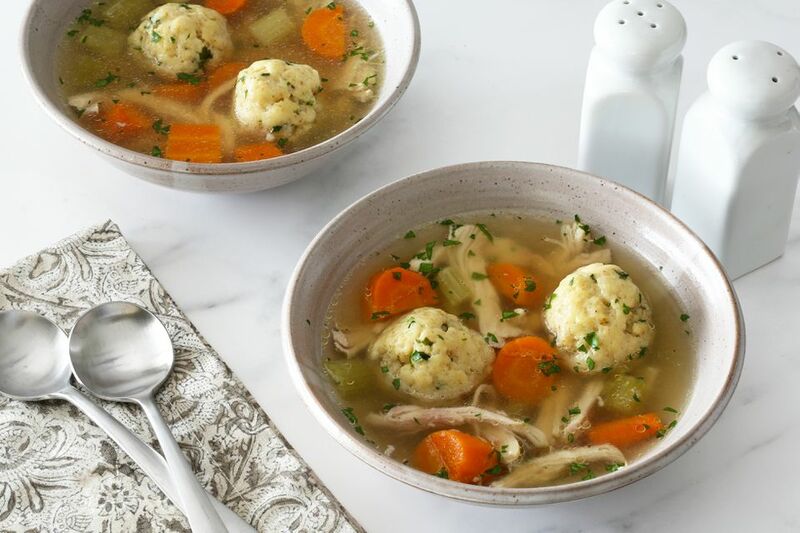 The broth for this Instant Pot matzo ball soup is so rich, your guests will think it simmered all day long on the stovetop. Thanks to the pressure cooker, it is possible to have a flavorful broth in just 35 minutes. This version uses chicken thighs, but a cut-up three-pound chicken is an excellent alternative. Just make sure to use bone-in chicken for the very best flavor. Matzo balls are Jewish dumplings made with matzo meal and they are traditionally served in chicken soup. The one bread allowed during Passover is unleavened matzo, which is similar to what was eaten by the fleeing Jews led from Egypt by Moses. Matzo crackers and matzo meal are widely available year-round. If you can't find matzo meal, it's easy to grind matzo crackers in your blender or food processor. Matzo balls take just a few minutes to mix and shape and then they are simmered in the chicken broth to fluffy, delicious perfection. Place the chicken thighs in the Instant Pot, followed by the water, celery, onion, carrots, garlic, parsley, bay leaf, kosher salt, and pepper. Lock the lid in place and turn the valve to the sealing position. Select the manual setting, high pressure, and set the timer for 35 minutes. When the time is up, let the pressure release naturally for 30 minutes. Carefully release the remaining pressure. Meanwhile, prepare the matzo ball mixture as the chicken and vegetables are cooking. In a large bowl, whisk the eggs until just slightly beaten. Add the vegetable oil or fat, matzo meal, salt, baking powder, and chopped parsley, if desired. Refrigerate the mixture until you are ready to shape and cook the matzo balls. With a slotted spoon, remove the chicken thighs and vegetables to a large bowl and set aside. Strain the broth through a fine mesh strainer, discarding the solids (garlic pieces, leaves, etc.). Pour the broth back into the Instant Pot; set it on sauté and bring to a boil. With moistened hands, shape the matzo mixture into small balls. You should have about 12 to 15 matzo balls. Drop the matzo balls into the boiling broth. Turn the sauté function to the low setting, 30 minutes. Cover the pot and simmer the matzo balls for 40 minutes. Note: the Instant Pot will automatically turn to the "keep warm" setting after 30 minutes, so cancel the setting at that point and set it to low sauté again for the additional 10 minutes. As the matzo balls cook, chop the cooked vegetables. Remove the chicken from the bones and discard the skin and bones. Shred the chicken. Add the chopped vegetables and chicken to the broth with the matzo balls and heat through. Add two matzo balls to each serving of soup. Sprinkle servings with fresh chopped dill or parsley, if desired. Remove leftover matzo balls from the soup and refrigerate them in a separate container. When planning this soup, make sure you factor in enough time for the buildup and release of pressure. It will take about 25 to 30 minutes for the soup to reach pressure and then at least 30 minutes for natural release. Chicken fat, or schmaltz, is a popular fat for matzo balls, but vegetable oil or duck fat are fine alternatives. One easy way to get rendered chicken fat is to make the broth and then refrigerate it until the fat solidifies on top. Then, make and chill the matzo balls, bring the broth to a boil, and proceed with the recipe. Add a dash of garlic powder to the matzo balls. Add 1/2 teaspoon of freshly grated ginger or about 1/4 teaspoon of ginger powder. Some recipes for matzo balls include water or seltzer water and no leavening ingredients. If desired, omit the baking powder and add 2 tablespoons of seltzer water to the matzo meal.